I feel in love with Stacey Lee's second novel, Outrun the Moon. 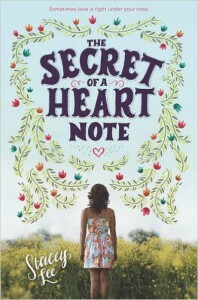 I was super excited to have won an ARC copy of her newest book, The Secret of a Heart Note. BFF is <3. She helped save the book when I was annoyed with Mimosa. It has all the typical cute, angst-y, confused, awkward, and adorable romance troubles. The twist was really obvious. It made the story feel a bit long and Mimosa a tad irritating. Like, just wanted to shake her and her mom so badly sometimes! Mimosa's old school mom was realistically annoying and stubborn. She's good and loves her daughter but is her own person with her own issues. I'm really glad how their relationship was done all the way through. The Secret of a Heart Note is good and cute, perfect for all the YA contemporary fans wanting a little drama and magic. The Secret of a Heart Note has a unique premise with a typical plot and diverse characters with standard relationships. While I enjoyed The Secret of a Heart Note, it didn't capture me like Outrun the Moon. I adore Stacey Lee's writing and skill, so I'll be reading her other book Under A Painted Sky and anything new.